There was a lot violence in America in July 1863. The Irish were right in the middle of it. Ethnic units were a way for the Union Army to help win Irish support for its cause. This support was not guaranteed: Though most Irish immigrants lived in the North, they were sympathetic to (as they saw it) the Confederacy’s struggle for independence from an overbearing government—it reminded them of their fight to be free of the British. Also, many Irish and Irish Americans were not against slavery. On the contrary, they favored a system that kept blacks out of the paid labor market and away from their jobs. As a result, Union officials had to promise many things in addition to ethnic regiments—enlistment bonuses, extra rations, state subsidies for soldiers’ families, Catholic chaplains—in order to assure that the North’s largest immigrant group would be fighting with them and not against them. 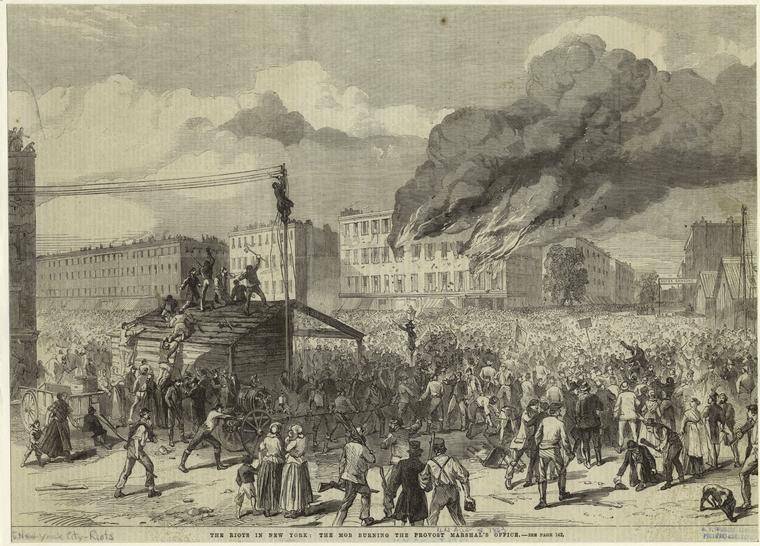 Irish Catholic rioters targeted Protestant charities, such as the Magdalene Asylum and Five Points Mission. By the late afternoon, protesters had entered the city’s arsenal, which they burned (killing ten of their own) when the police arrived. The rioters also began attacking blacks, shouting racial slurs, and torching homes of poor African Americans on the west side of 30th Street. In one of the most infamous incidents, a mob burned the Colored Orphan Asylum on west 44th Street, although its 237 children escaped to safety. Federal troops were needed to finally quell the riot, one of the worst outbreaks of insurrection in U.S. history. At least 120 people were killed and hundreds more were injured. The outburst ended organized Irish participation in the Civil War. Tensions between Irish immigrants, Irish-Americans and the African-American community would continue through Reconstruction and deep into the 20th century, including the Boston busing crisis of the 1970s and 1980s. This entry was posted in History, Irish America and tagged Boston, Civil War, Irish Brigades, New York on July 4, 2013 by admin. Season One of “Downton Abbey” begins in April 1912 with news of the Titanic disaster. Men like Branson were talking again about Ireland becoming an independent country after centuries of English (and later British) rule. In the spring of 1914, the British Parliament authorized a form of limited domestic autonomy for Ireland called home rule. But the political accommodation was immediately suspended due to the outbreak of war with Germany. Matthew Crawley and the footmen William and Thomas fight; Branson didn’t go because as an Irish national, he wasn’t subject to the draft. The revolutionaries had scant support in Dublin and the rest of Ireland, since many Irish men volunteered to fight on the continent with British troops. The “Easter Rising” was crushed in a week. Branson remarks in Season Two that he would have returned to Ireland to fight with the republicans if the fighting hadn’t ended so fast. Plus, he was sweet on Sybil. The British government soon made the tactical error of executing the revolutionary leaders. This created a backlash in Ireland (and America) that shifted popular support to the nationalist cause. By January 1919, two months after the armistice ending World War I, Irish republicans once again declared independence, established their own government in Dublin and began a guerilla war against British military and police forces. The conflict, known as the Irish War of Independence or Anglo-Irish War, took place about the time that Season Three starts. The brutality of the period is probably best exemplified by the events of “Bloody Sunday” in November 1920. Irish republican operatives under the direction of Michael Collins carried out the assassinations of 19 British Army intelligence officers living in Dublin. The British retaliated later the same day by opening fire on the civilian crowd at a football match, killing 14 and wounding scores more. The two sides reached a ceasefire in the summer of 1921 and began to negotiate a peace treaty. In early 1922 this resulted in the creation of the Irish Free State for 26 counties in southern Ireland. Six northeast counties remained linked to Britain and were partitioned as Northern Ireland. Free State status was similar to Britain’s arrangements with Canada and Australia. It provided more domestic autonomy than originally contemplated by home rule, but Ireland remained under the monarchy and far short of an independent republic. This caused a split between hardline republicans and moderate nationalists. The ensuing Irish Civil War over the next year claimed more lives than the three-year conflict with Britain. The Free State forces prevailed by the summer of 1923 and a decade of violence in Ireland finally came to an end. The 26 counties of the south would not achieve republic status until 1949. The six northeast counties remain partitioned to this day. For “Downton” fans looking for more details, the BBC has an excellent online presentation that explores the entire period “through essays, photographs, sound archive, music and newspapers from the period.” The Irish Bureau of Military History also has a deep archive of interviews, maps and images from the war years. This entry was posted in Arts & Culture, History and tagged 1916, Anglo-Irish War, Bloody Sunday, Civil War, Easter Rising on January 21, 2013 by admin.